I skipped out on yoga class this evening — I know, bad bookgirl. I wanted to go but the weather is a bit yucky and I didn’t want to go out. I’m not fond of storms but I have to say there is something so wonderful and cozy about staying in with a cup of tea and reading. Which is what I did. Plus I had to add some new books to the bookshelves. I’ve been very lucky and have received a few ARCs which I want to tell you about. Little Bee by Chris Cleave. I’ve read so many wonderful reviews of this book so you can only imagine how excited I was to get a copy. e Squared by Matt Beaumont. I don’t know that I would have ever picked this up based on the cover and title but it sounds like it could be a funny novel. The Girl Who Fell From the Sky by Heidi W. Durrow. I just love the cover of this book. Conspirata by Robert Harris. Politics in Ancient Rome. I’ve not read any of his books but oddly enough I was thinking about them as I’m reading The Complete Polysyllabic Spree which makes a mention of them. I love it when one book leads you to another. And, I found another bookish item I had to share with you. I know I want one of these for my MacBook. Isn’t it cool? That really is a very nice cover. I love unique, really cool ideas like that. They ought to make those for ereaders too. My mom has one but us embarassed about it (she was a reading teacher and swore she’d never go electronic). This might assuage her guilt. That’s a lovely cover! I know I’d love to have it if I’ve a MacBook! So cool! I want one for my macbook, too! I loved Little Bee! It didn’t quite make my Top Ten for 2009, but it’s certainly in the top twenty. I’m still a bit haunted by the characters and would like to give it a second reading one of these days. Little Bee – I keep hearing about this one. Some great books there. I hope you enjoy them. It’s a tea day in this part of the world, too…snow day! (Although I’m not partial to herbal teas, I’m a King Cole girl all the way!) Cool cover for your MacBook. I am jealous you got Little Bee! I’ve been wanting to read that one for awhile now. I love that laptop cover – Michael had actually shown me that the other day and I had totally forgotten about it! The cover is really great for The Girl Who Fell from the Sky and the story sounds interesting as does Little Bee. I should be wrapping up my latest Kathy Reichs book finally and will be reading Witch Child next – probably bundled up in blankets and several cups of tea – it dropped below freezing here and is supposed to be that way for the next week! What a great MacBook cover! I always wish I was the clever person who came up with ideas like those! I love your macbook cover. I need to get this. Thanks. hi iliana, looove that macbook cover! (btw, i am so loving your handmade books. i only just noticed that you’re selling so many different designs!) happy weekend. Oh my heavens! That cover is almost enough to make me want a MacBook! lol Chuck and I have the Mac vs. PC war embodied in our household every day. I’m with you on staying in to read all snug and cozy with a cup o’tea. I would love to be doing that right now. It’s about 33 outside, and I have to teach for the next two hours. Maybe no one will show. Jrav – Oh a cover like that for ereaders would be perfect wouldn’t it? Too funny about your mom. I love books and can’t imagine giving them up totally for a ereader but I do want one! Melody – I promise to keep you posted on Little Bee. It’s got such a pretty cover too doesn’t it? Les in NE – Yay, I can’t wait to read it. I love it when a character stays with you for a long time after the last page has been turned. vivienne – I know. I’ve read several reviews and they all rave about it so I have high hopes! Christie – I used to not like teas too much but have been trying different flavors and have found some very yummy ones. Juliann – It is isn’t it? I need to check out more of their flavors. I believe they have a vanilla almond that is delicious. Stefanie – It was so windy and rainy this morning. I almost wanted to call my boss and ask if I could have a rain day 🙂 Yea, I don’t really need the cover either as I don’t really take my MacBook out with me but still, I want one. haha..
Stephanie – I was a lucky bookgirl wasn’t I! Christine – Enjoy your weekend girl and stay warm! You know where I wish we could go hang out right now? That fun little tea shop in Dallas. Would love to catch up with you there! aloi – Thank you! 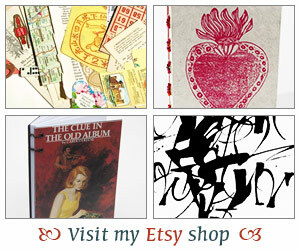 I’m having a blast making books. Have so many other projects in mind so hopefully one day they’ll make it to the shop. andi – Ha,ha… We are definitely a Mac home here at Casa Bookgirl. I heard the Dallas area got very cold. Stay warm girl! Kailana – I love to stay indoors every once in a while but I admit I get cabin fever very quickly so I don’t know how I would deal with lots of snowstorms! Hope you get out soon! BtW…Little Bee is fantastic –enjoy! the macbook cover is very nice! the girl who fell from the sky sounds good, and I like the cover also. I’ve not heard of any of those books–so I’ll be looking forward to what you have to say about them! 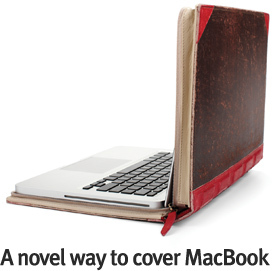 And you Have to get one of those covers for your macbook–too cool.